Western Environmental Liner also carries geotextile filter fabric that can be used in multiple liner applications. The non-woven geotextile is made up of polypropylene fibers that are needle punched and which looks and feels like felt. This fabric is engineered for puncture resistance, filtration, soil stabilization, separation, drainage and gas transmission, cushion and liner protection - all of which make it perfect for applications such as dewatering projects, sludge lagoons, waste lagoons, flowback cleanup, and many others. Our geotextile fabric is available in several variations, from 4 oz to 32 oz. If any specific gauge is needed, we are very capable of providing it for you. For dewatering projects, Western Environmental liner can provide you with geotextile tubes and/or geotextile bags. This fabric comes in 15-ft. wide and can be easily seamed to whatever size and shape you need. Western Environmental Liner uses state of the art sewing & welding equipment to ensure the durability of your product. Geotextile tubes and geotextile bags are one of the most effective means to filter water from mud, sediments, debris and other contaminants - you will truly be amazed with the result. Western Environmental Liner can also provide you with a geotextile underlayment liner for extra protection for your primary liner. Having an underlayment can prolong the life of your liner, protecting it from any sharp objects that can possibly puncture the liner, making it more durable and long lasting. 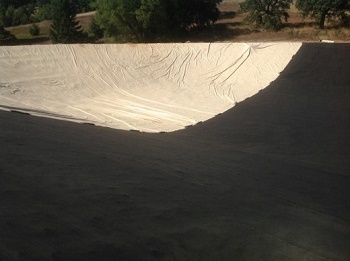 With the geotextile used as underlayment, this makes your liner even more resistant to hydrostatic pressure. We are very capable of fabricating geotextile into whatever shape and size you need. Western Environmental Liner can fabricate geotextile liner to the biggest panel possible in order to make installation easier and more convenient for you, saving you time and money in the process. Western Environmental Liner can guide you and give you our expert advice for whatever application you have in mind. We can custom-fabricate our geotextile to however it suits your application. With our multiple factories located in Tolleson AZ, Romulus NY and Great Bend KS, we can assure you that we will be able to meet your needs in a reasonable amount of time. Feel free to contact us today for any questions and inquiries and one of our liner experts will be happy assist you.